Olive is like balsamic vinegars…once you visit Europe, you can taste the differences. There’s a difference in color, in consistency, and of course flavor. We were sent Premium Select 100% Extra Virgin Olive Oil First Cold Press by Iberia. This Spanish olive oil is not organic, and Iberia is a brand found at major outlets like Wal*Mart that scare me. That being said, I like this olive oil. What sets Iberia apart from other brands is how the brand sources authentic, fresh ingredients from the original climates in which they grow. For example, each olive is hand-picked from the trees of Spain and seasoned with peppers grown in South America. 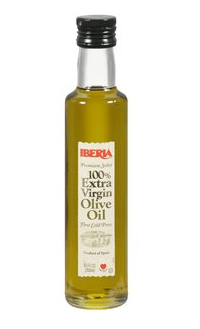 Limited and not conclusive scientific evidence suggests that eating about 2 tablespoons of Iberia 100% Extra Virgin Olive Oil daily may reduce the risk of coronary heart disease due to the monounsaturated fat in olive oil. Since the 1930s, Iberia Foods has been providing Americans with an authentic Hispanic source of products including olives, beans, and canned food from Spain. One of the best examples of the brand’s commitment to authenticity is its quality extra-virgin olive oil. Utilizing a first cold-press technique, each olive is carefully harvested and pressed within twenty-four hours. No heat or chemicals are employed throughout the extraction process, which results in an oil of low acidity with a fresh grassy scent. An essential part of a healthy diet, olive oil in moderate doses of two tablespoons a day may reduce the risk of coronary heart disease because it is naturally free of cholesterol, sodium, and carbohydrates. Oleic Acid, a mono-unsaturated fat known to lower the risk of cancer, is also found within Iberia’s quality oils. I don’t think you will be disappointed with this olive oil, but I do wish it was organic. I have not traveled in Spain, but all over Tuscany the olive trees were organically-grown.